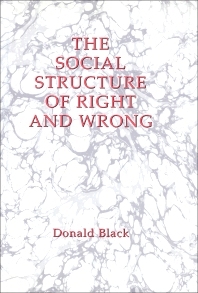 The Social Structure of Right and Wrong focuses on formulations that predict and explain the nature of social control throughout the world and across history. The publication first offers information on social control as a dependent variable, crime as a social control, and compensation and the social structure of misfortune. Discussions focus on the theory of compensation, traditional self-help, concept of social control, varieties of normative behavior, models of social control, and quantity of normative variation. The text then elaborates on social control of the self and elementary forms of conflict management. The manuscript takes a look at the theory of third party and on taking sides, including legal, latent, and slow partisanship, social gravitation, models of partisanship, settlement roles, partisanship in tribal societies, and typology of third parties. The text then examines the factors involved in making enemies, as well as social repulsion, moral evolution, and third-party and unilateral moralism. The publication is a dependable source of data for sociologists and researchers interested in the social structure of right and wrong. Center for Criminal Justice, Harvard Law School, Cambridge, Massachusetts, U.S.A.